When caring for people who require adaptive chairs, seat harnesses are an absolute necessity. They allow the person in the chair to maintain a healthy and safe upright position and can make the difference between a safe home and an environment for injuries. These are not just seat harnesses for the disabled. Inexpensive to install and easy to clean, seat harnesses are the perfect addition for any person who uses a transport wheelchair, needs secure support on a feeding chair or for those who lack the necessary back strength to stay perfectly upright. 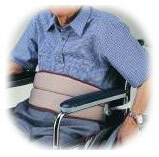 Seat harnesses are essentially slings that attach to the chair and wrap around the person’s torso. They typically consist of bands that are several inches wide for comfort. They are used to keep a person held back against a dining chair or wheelchair for safety. When a handicapped person is unable to maintain a straight, seated position the risk for injury is great. Constantly slumping over makes it difficult to breathe and swallow increasing the risk of aspiration or other medical problem. It also causes back pain that the person may or may not be able to vocalize. These seat harnesses act like wheelchair posture belts to keep the person upright. How To Keep A Person Still When Feeding? A feeding harness is the perfect solution to this problem of a person, child or baby that constantly moves when feeding. 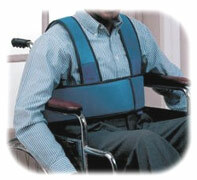 It will keep the person seated upright to minimize the risk of choking or aspiration into the lungs. Proper harnesses allow you to keep your loved one in a home environment longer without the risk of injuries that come from improper seating positions. When transferring a person in a wheelchair from one location to another, gait belts are quite helpful but harnesses are also necessary when transporting the person. Even a handicapped person who has strong back muscles and the ability to sit upright unassisted can benefit from a chair harness when leaving the house to go to the store. The harness will help keep him or her safely upright, even when the transportation van is coming to a stop or if you have to bring the chair to a sudden stop in the store. Avoid dangerous injuries when traveling with your loved one by investing in a quality wheelchair harness. Harnesses are simple to install to an adaptive chair and can be purchased from your local supplier. Ideally they should be hand washed although they can be run through the machine on the gentle cycle if heavily soiled. They should never be placed in the dryer as that could damage the material. A reclining shower wheelchair is used by caregivers to give a shower to an elderly or disabled person. These chairs are most often used in hospitals, nursing centers, and in retirement homes but can be a great addition to a household with walk in showers. They can be utilized to bathe a person who is confined to a wheelchair and who is not able to move their arms and legs such as a paraplegic or quadriplegic. 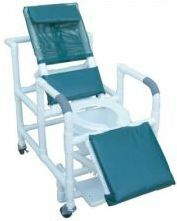 The shower chair permits a nurse or caregiver to shower a patient without having to use regular shower chairs or bathtub lifts. 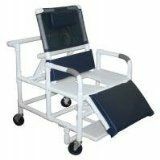 The reclining shower chair and other equipments has provided home caregivers assistance in bathing patients who cannot bath themselves and also provided comfort for those who, up until now, were not able to benefit from receiving a bath. The chairs come in a variety of models. It might have drop arms or an elongated padded seat, various reclining positions and footrests with adjustable heights. Some times the chairs can be used as shower commodes if it comes with a padded seat and can be used over a toilet in addition to being used in a shower. Since the chairs have small wheels, they can be moved from rooms and between showers. If the chair is made of aluminum and is relatively light, the chair can be lifted or adjusted without difficulty. The costs of reclining shower wheel chairs varied in price online from just over $300 through $1000 to over $1500, depending on the complexity of the chair and added options. Rolling Shower Chairs with Wheels – Weight capacity of 325lbs. External width of 24 inches capable of fitting through most shower doors. Seating area is 20 inches. Reclining Shower Wheelchairs – Seating width of 20 inches. Reclining Commode Chairs – Comes with a 10 quart commode bucket or pail. Bariatric Reclining Shower Chairs – Has an internal seat width of 30 inches, perfect for any large or obese individual. Weight capacity of 700lbs. To maintain the reclining shower wheel chair, clean it every month. Do so by putting the chair inside the shower stall to clean it. Clean with a tile cleaner as that stops mildew and mold more effectively. Alternatively, use a mixture of water and ammonia. A scrub brush is effective to reach small spaces but do not scour strongly to keep from scratching the surface. Clean the shower chair each time it is used by wiping it dry. Dry any gaps as well as the bottom of the seat to prevent mildew and mold from developing. Optimally, the chair should be totally cleaned and dried before it is used again. Do not keep the chair in the shower as the fungus and bacteria develop where there is increased moisture. If the chair has to be kept in the shower stall, be certain that the whole shower and chair is dried each time the stall is used. Clean the shower frequently and you will have a reclining shower chair that will last a lifetime.